Every year at Comic-Con, one of the big draws is always AMC's The Walking Dead, which attracts 7,000 fans to its panel in Hall H for a glimpse at the new season. This year may be one of their biggest panels yet, with anticipation for Season 7 higher than ever, especially given the cliffhanger fans were left with in the Season 6 finale. Now that the panel has just wrapped up, we have the full trailer right here, which offers our first look at The Kingdom and its leader King Ezekiel, played by actor Khary Payton. It has long been rumored that The Kingdom will surface on Walking Dead this season, but we haven't had any confirmation until now. In Robert Kirkman's comics, The Kingdom is introduced shortly after Negan's (Jeffrey Dean Morgan) introduction, a group who have fortified a college campus, lead by a man named Ezekiel. 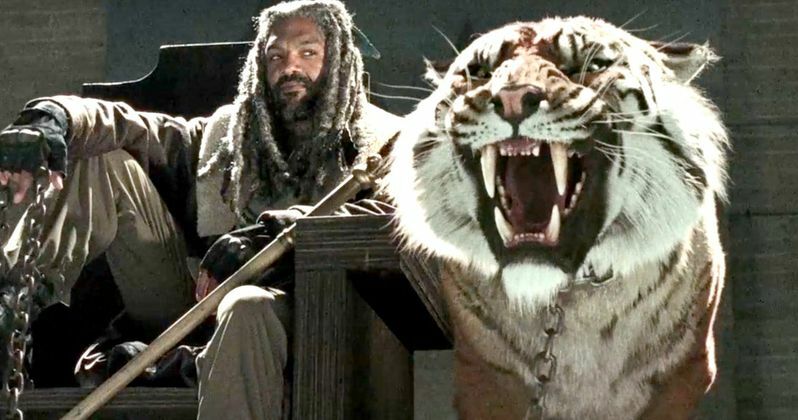 One of this seasons' biggest questions is how they will portray Ezekiel's pet tiger, but there is also a much bigger burning question at hand for the AMC series. Andrew Lincoln, Norman Reedus, Steven Yeun, Lauren Cohan, Danai Gurira, Chandler Riggs, Sonequa Martin-Green, Michael Cudlitz, Josh McDermitt, Ross Marquand, Christian Serratos and Jeffrey Dean Morgan joined executive producer and showrunner Scott M. Gimple, executive producer Robert Kirkman, executive producer Gale Anne Hurd, executive producer Dave Alpert, and special effects makeup supervisor and executive producer Greg Nicotero in a panel moderated by Chris Hardwick (The Nerdist, Talking Dead). All of the cast members were present in the final scene of the Season 6 finale, when Jeffrey Dean Morgan's Negan picked his victim at random, who we didn't see as the season came to an end. Ever since the Season 6 finale, fans have offered various theories as to who will be the victim, with one individual isolating the audio from the mysterious death scene to try and determine who was killed. While we certainly won't know who was killed until the new season premieres, there have been plenty of theories. Some have theorized that Lauren Cohen's Maggie was killed, since she has recently been posting Instagram photos from New York City and other undisclosed locations that certainly don't seem to be Atlanta, where the show is currently in production. There have also been rumors that she has been absent from the set since the end of filming the third episode, but she hasn't been the only one who has been absent. The actress' on-screen husband Steven Yeun also hasn't been seen on the set recently, with the actor filming a new movie entitled Okja for director Bong Joon-ho. Along with the trailer, the show also announced that Season 7 will premiere on Sunday, October 23 at 9 PM ET on AMC. This will directly follow the network's hit spinoff Fear the Walking Dead, which returns with the back half of their second season on Sunday, August 21 at 9 PM ET. Take a look at the first footage from Season 7 of The Walking Dead below.